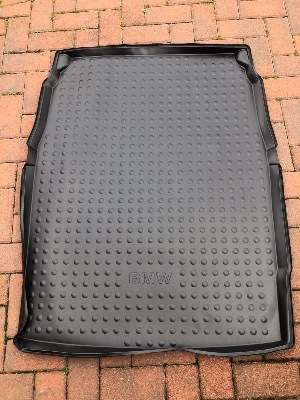 Genuine BMW fitted luggage compartment mat for BMW F10 models. This mat has some distortion of the edges due to being folded during storage. These can be seen in the photo. The BMW part number is 51472153687. Please check this against your VIN number using the BMW electronic parts catalogue to make sure it is correct for your car before buying. If you do not know how to do this, send us the last 7 digits of your VIN number and we will check for you. Customers outside of the UK mainland must email for a shipping price before buying.